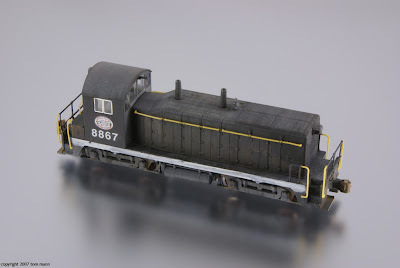 The Truth About Model Trains: Weathering Black: Ideas for Weathering the Hardest Color to Weather. Weathering Black: Ideas for Weathering the Hardest Color to Weather. When my friends and I get together to discuss modeling, we almost always discuss weathering. 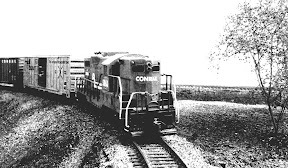 And in our conversations, we always talk about how difficult it is to weather black locomotives and freight cars. How come it's so difficult? For starters, it's almost impossible to get rust colors to "show up" on a black surface. Simply painting surface rust and rust streaks over black is futile - the paint disappears unlike it does on lighter colors like yellow or even boxcar red. So before you weather black, you have to take extra steps to fade the black before you do any weathering work. Ok, follow along. I wanted to paint Kato's new NW2 into Indiana Harbor Belt's early scheme. This scheme lasted at least until the late 70's, and a look through all the photos on http://www.rrpicturearchives.net show some pretty well-worn IHB prototypes. So in this example, we have the flexibility of mixing colors that custom painting affords. If your model is already painted and just needs weathering, the ideas in this article can also be used. I start by stripping the Kato paint with 91% alcohol. It takes a few hours for the alcohol to break down the paint so that it can be brushed away with a toothbrush. 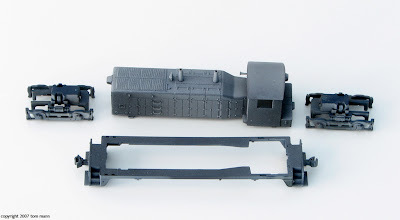 Typically, a black engine or freight car's will fade to a variety of gray/dirt/grime colors. It really depends on the prototype. It's possible to have a layer of green grime, tan dust, gray or brown dirt over top of a base coat of black or a faded black (maybe this is dark gray-again, it depends!). In the prototype photo that I chose to model, there was a fairly black base coat still showing through patches of gray, green, and tan. I chose a slightly lighter color than black for a base coat - Polyscale Tarnished Black. If you have an already decorated model, you probably want to skip this step, since it'll cover up any heralds and road numbers. In this case, apply a fade coat to your model by painting with a thinned light tan or gray color. Note that in this photo, the shift away from true black is drastic. Subsequent additions of color will darken the model. The idea here is to apply overlapping colors with the airbrush, or if you choose, paint brush. Try a combination of dry brushing and washes. Remove some colors with 70% alcohol. Apply some surface rust. Black washes allow you to tone down and blend colors that appear too bright. Since correction is so easy, it's better to go too light than too dark in the base coat. By starting with a color lighter than black, any weathering you apply will "pop". 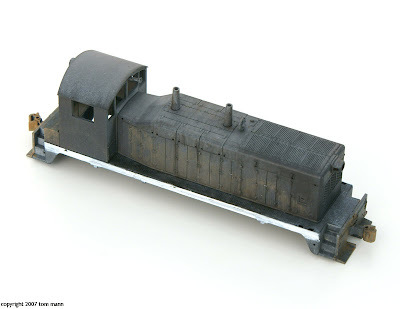 Try these ideas out on hoppers and tank cars! Tom Mann like.. um.. you know..... rocks, dude! You're an inspiration to us weathering wanna-be's. Keep on sharing those tasty techniques! ttamt.blogspot.com is very informative. The article is very professionally written. I enjoy reading ttamt.blogspot.com every day.